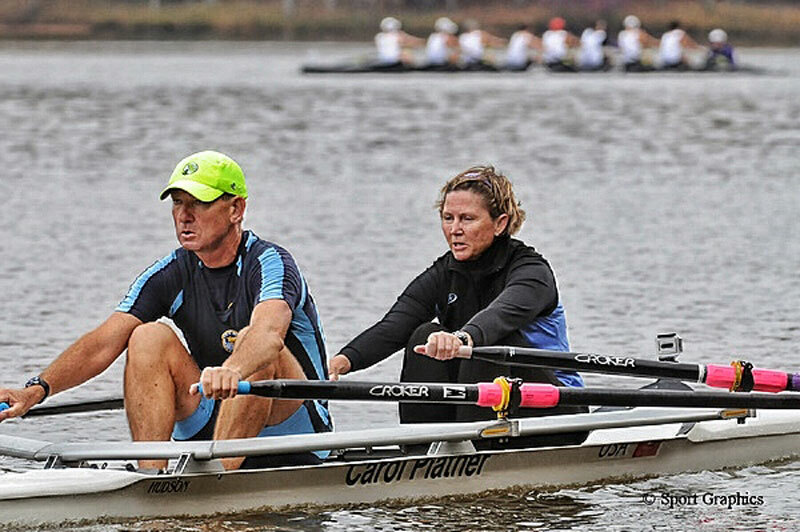 Michael and Anita Swain competed in the long distance rowing races in Virginia last weekend, along with 5,000 other rowers, with Michael Swain collecting a silver medal. Mr Swain competed in three races and Ms Swain in two; totaling 50,000 meters between the two of them. The event is just south of Washington DC, along the very windy Occoquan river. This makes it particularly difficult for the rowers as they face backwards in the boat, relying on the occasional glance over the shoulder to find the best course to take. Mr Swain teamed up with US rowing partner Col. Tom Riddle for the men’s double sculls race and repeated their result of two years ago and won the silver medal. This followed after both had competed against each other 90 minutes earlier in the singles races. “We were particularly pleased because all the other crews would have been competing together all year and fine-tuning their technique and tactics; our first outing together was the actual race,” Mr Swain said. Michael Swain founded the Bermuda Rowing Association in 2004, and has competed most years since then. In 2014 he teamed up with Bermudian Lulu Headstrom to compete at the prestigious Head of the Charles regatta as part of their 50th anniversary celebrations. Ms Headstrom has gone on to row with Stamford University after several top-flight universities were trying to attract her rowing talents. Ms Swain teamed up with US rowing partner Robin Quinn to compete in the women’s double sculls, and the Swains then swapped partners to compete against each other in the mixed doubles. Ms Swain said, “We trained hard for these events as we knew how draining they would be and the fast recovery time needed to get back on the water to do it all over again, and again! “We were very lucky with the weather and only faced the headwinds over the final 1,000 meters – just when one is trying to ‘empty the tank’ of any remaining energy and sprinting for the line. Mr Swain said, “I am very proud of Anita as this was her first time competing overseas. To do so well at such a large event is a credit to her training and dedication. Well done. A great achievement !!!!! Hard work and dedication paying off, good work guys congrats!